Ex-hostages of a gunman who killed four people in a Paris kosher supermarket in early January are suing a French broadcaster over its live coverage of the attack, saying the channel had put at high risk the hostages' lives. 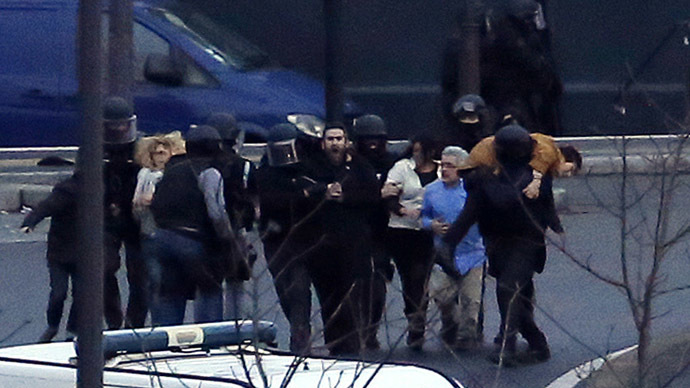 According to Le Parisien, the Paris prosecutor has opened a preliminary investigation over a complaint filed by several former hostages of gunman Amedy Coulibaly for "endangering the lives of others." A judge will have to say whether the French BFMTV channel had fully assessed the threat it allegedly posed to hostages' safety. The news channel, along with some other broadcasters, revealed in live reports that several shoppers were hiding in the kosher grocery. When Coulibaly, 32, stormed the store, a Muslim shop assistant, Lassana Bathily, hid seven shoppers in the basement cold storage room, and the gunman never found out they were hiding in there. The hiding hostages, one with a baby of 10 months, got in touch with their families by mobile phones. The ex-hostages believe that if the gunman had found out that they were hiding, they would not have survived the siege. "Staying in the cold room, we knew we had disobeyed. Our main concern was that nobody found out, making no noise. If Coulibaly had discovered our presence there could have been retaliation,” Le Parisien has quoted one of the plaintiffs as saying. Coulibaly shot and killed an unarmed policewoman on January 8 before taking hostages at the Porte Vincennes supermarket in the east of Paris the following day. After he murdered four people, police stormed the kosher store and fatally shot him. During the siege, Coulibaly told authorities that he had coordinated the attack with the Charlie Hebdo killers. Shortly before being shot by police, he told BFMTV that he had links to the Islamic State (IS, formerly ISIS/ISIL) militant group and had “synchronized” his actions with the Kouachis. The gunman didn’t end the call, the police heard him praying and they launched the assault. Lawyer Patrick Klugman, representing the families, said that TV reporters not only disrupted the arrival of security forces but put in jeopardy all those at the grocery. In the complaint, the lawyer refers to the Act of September 30, 1986, on Freedom of Communication. "This text says that freedom of expression should hold respect to dignity of the human being and the safeguarding of public order. In this case, these guarantees have not been respected," the lawyer maintains, calling for the establishment of a new legal framework on live information in a time of crisis.